Description: Southbound manifest freight at Amtrak Station in Norman, OK. Description: The 5490 is leading a westbound on a rainy spring day. Title: Here comes the first train of the day! Description: BNSF 5490 leads a westbound stack train through Lockport. Description: Just in from Chicago, and headed back the same day according to the conductor! Title: BNSF 7638 West, Cajon Jct. 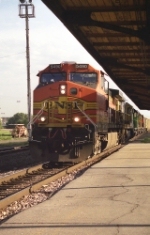 Title: BNSF C44-9W 5490 sits on the siding at Lawrence with an eastbound. Description: Brand spankin' new GEVO and a Dash-9 trailing. Description: Z-CHCPTL speeds through town witha smoky second unit! Description: Amtrak 715's tail end is seen about to disappear behind the BNSF 5490's eastbound Z train. Description: Rolling through with an eastbound Z. Description: Burlington Northern Santa Fé. 5490 northbound approaching tunnel #2. Description: Burlington Northern Santa Fé. 5490 northbound approaching Union Pacific tunnel #2.